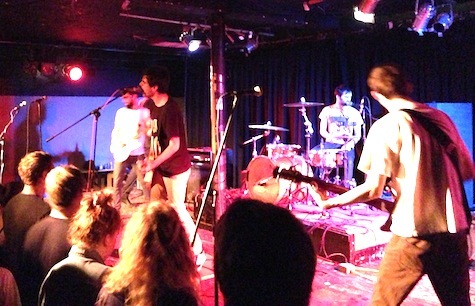 Titus Andronicus at Sokol Underground, Nov. 21, 2012. Is this the biggest indie-rock show The Lookout Lounge has ever hosted? Craig Finn is the lead dude from The Hold Steady striking out on his own for a solo tour. Titus Andronicus, known for the long, drawn-out waltz-time punk rock songs, is one of the more interesting indie bands to emerge from Matador Records in the past half decade. You get both tonight at Lookout Lounge, along with Lincoln’s Universe Contest (on their way to SXSW) and Omaha band Gordon (get there early, you don’t want to miss them) for one price of $18. Tickets available at the door. I have yet to venture into the Lookout Lounge. This could be the night. Also tonight, Americana/folk band Ragged Company headlines at fabulous O’Leaver’s. Joining them is Justin Ready & the Echo Prairie and Omaha buzz band The Hottman Sisters. For whatever reason, I thought the Hottmans were a country & western band, then Ian sent me a link to the following Live at O’Leaver’s. Check it. $5, 9:30 p.m. And pssst… the back patio is open! Also tonight, Chicago is invading Milk Run. Chi-town bands Ratboy and Coaster headline, with locals Bed Rest and Crypt Kid. $7, 9 p.m. Tomorrow night Mitch Gettman and The Way Out open for Wichita band The Travel Guide. $7, 9 p.m. While down at Slowdown Jr. Omaha emo band Super Ghost headlines a show with Blét, This Machine Kills Vibes and Intergalactic Star Hero. $8, 9 p.m.
By the way, my favorite time of year begins Sunday morning at 2 a.m. — that’s when Daylight Savings Time kicks in. Does that mean we lose an hour of drinking or gain an hour of drinking? One more thing: The Brigadiers are headlining a show at Reverb Lounge Sunday night with Glen Hollow and Polka Police. The event is a fundraiser for art/photography startup Copper Collective. They’re trying to construct a dark room. The 7:30 p.m. show is $7. Find out more here. That’s it for shows. If I missed your, put it in the comments section. Have a great weekend. We’re playing a benefit concert Sunday night at Reverb Lounge for Art/Photography startup, Copper Collective with Glen Hollow and Polka Police to help raise money for a dark room in Copper Collective’s space in the Omar Baking Building. Show starts at 7:30. $7.